As I have mentioned earlier, there have been very few espionage novels after the Cold War that can match the narrative scale or philosophical depth of what came before them. A promising exception could be Daniel Silva, who has been writing for a while. His creation, the art restorer and Mossad assassin Gabriel Allon, debuted in 2000 with ‘The Kill Artist’. A product of Israel’s 1970s Munich reprisals, Allon and the world he inhabits has evolved perceptibly in scale. In the past few years, the series has directly referred to events in the Middle-East and Europe. In ‘The Black Widow’ (2016), a terror attack in Paris causes Allon, reluctantly in line to head the Mossad, to launch an operation. He recruits Natalie Mizrahi, a doctor born to French Jewish emigres, to masquerade as a French Muslim, Leila Hadawi, and get recruited by the Islamic State. Silva does what we have fruitlessly expected authors to do for a while, and takes the story to Raqqa, Syria, with a notable stopover at Molenbeek in Belgium, familiar to us after the attacks of 2015. Silva falters occasionally, such as with the nom de guerre of the terror mastermind, a certain ‘Saladin’. I suppose I could write a separate post on the familiarity of the 12th century Ayyubid general to the European consciousness. Saladin recurs as a name for Middle-Eastern characters in thrillers, notably in Stephen Hunter’s ‘The Second Saladin’ (1982). In ‘The Black Widow’, however, it strikes a false note. It is unlikely that a senior Islamic State functionary, trusted by ‘the Leader’ to boot, would go to war with the West under the name of a medieval Kurd. Much before the scene shifts to Syria, however, while talking about the need for Israeli intervention in that country, Allon asks Natalie if she is familiar with Arnold Toynbee’s theory about history’s two pivot points — the Central Asian Oxus-Jaxartes basin, and the Syria-Palestine axis. Silva’s unsaid inference, to which I agree, is the IS, and now the post-IS Middle-East require intervention by world powers and neighbours. The degree of intervention needs, of course, to be individually determined. For Allon it is a single directed anti-terror op. Apart from the welcome attempt at a theoretical underpinning to contemporary espionage, Silva’s choice of Toynbee, and quoted by a Mossad man, is interesting. In his multi-volume ‘A Study of History’, Toynbee examines 19 ‘major’ civilisations (incidentally, dividing Indian civilisations into ‘Indic’ and ‘Hindu’), four ‘abortive’ and an equal number of ‘arrested’ civilisations. But he also refers to ‘fossil’ societies, born of religious discrimination, classifying Judaic culture as one of them, a part of the abortive Syriac civilization. Considering the re-appraisal of Syriac culture in the intervening decades, there might be some substance to this, but in the 1950s Toynbee was suspected of anti-semitism over this classification, and it remains problematic. The Jewish (not to mention Samaritan) response to Rome has been extensively documented, and its connection to the rise of Islam is being researched as we speak. A large part of the Western understanding of Islamic fundamentalism also revolves around the reaction theory. This, in my view, is a trifle simplistic, because it does not take into account the nature of a culture which reacts in just such a manner to the Other, and not in a different way. That is, why are some cultures more, shall we say, designed to take the zealotry option? How did Japanese society, to cite an example, accommodate its still-thriving xenophobia and ultra-nationalism with capitalism and Western dominance? These questions apart, Toynbee’s theories, a lot of which have still not been completely discarded, are a useful entrepot to understanding Islamic societies’ response to the West. That an espionage fiction writer has made the effort to include this politico-historiographical tidbit is commendable. 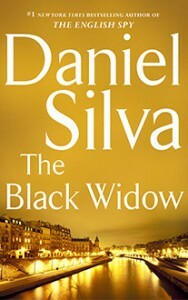 I expect Silva to theorise further on contemporary politics in forthcoming Allon books, of which the sequel to ‘The Black Widow’, titled ‘House of Spies’ was released this year. This entry was posted in Fiction, History, Politics on 22nd September 2017 by Siddhartha Sarma.